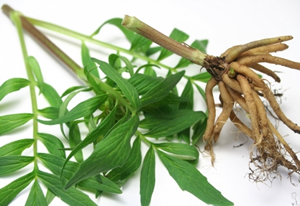 Preparation Methods & Dosage :Valerian can be made into tea, taken in capsules, or used as an extract. Valerian Side Effects: Generally considered safe, large amounts can cause stomach upsets. 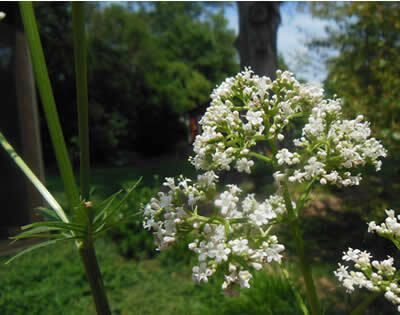 In about 5 percent of the population, valerian acts as a stimulant, be aware of this effect if you are new to the herb. An attractive fern-like plant with fragrant pinkish flowers, the roots which hold the medicinal value are earthy , strong and pungent. There are several native species throughout North America, with size being the primary difference among them. The domestic plant can reach five feet in height and features lance-shaped leaves that get progressively smaller at the top. Flowers are borne in branched clusters of small white to pink blossoms. Once you become familiar with this plant, identification is as easy as scratching a root to release the unmistakable odor. Valerian is easy to grow from seed, you can sow directly into warm garden soil, or transplant in early summer. Sun or shade, moist soil. The plant can reach heights of 5 feet or more with plenty of sun and water. 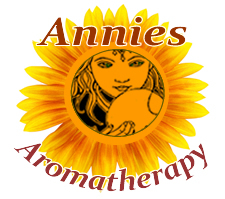 The whole plant is fragrant, the leaves smell lightly of cinnamon and vanilla, the root has its own musty, potent aroma. Valerian is sedative to humans, but excites both cats and mice. In the legend of the Pied Piper of Hamlin, he baited the rodents with valerian to drive them out of the city. The flowers are used in charm bags to encourage love, protection and sleep. 85. White	Linda B., M.D. "The Herbal Drugstore" (2003): Its active ingredients, valepotriates, blind to benzodiazepine receptor sites in the brain- a mechanism similar to drugs like Valium. The herb, however, seems to be more beneficial to the nervous system, and does not cause dependence or tolerance. 88. Gladstar, Rosemary	"Herbal Healing for Women"